We saw four draws in four classical games in the two semi-final matches (replay). Thus both match-ups headed to the playoffs. In the match-up between Wesley So and Ding Liren, the first pair of rapid games (25mins + 10sec) ended in further draws, but in the second pair of rapid games (10mins + 10sec), Ding Liren drew first blood in the first game and in the second game he was happy enough for the draw. Replay games here. In the other table: the Levon Aronian vs. Maxime Vachier-Lagrave playoff games, we saw a couple of decisive games in the first rapid pair of games, until the match was decided with the Armageddon game. Replay the games here. In the single Armageddon game, Aronian (White) had 5 minutes and MVL (Black) had 4 minutes, with the increment of 3 seconds per move started to kick in only from move 61. Had the game ended in a draw, Black would have been able to claim the win for the match. Nevertheless, the game ended decisively, in favor of White. Thus, Ding Liren and Levon Aronian will battle it out in the Finals for the FIDE World Cup 2017 crown. 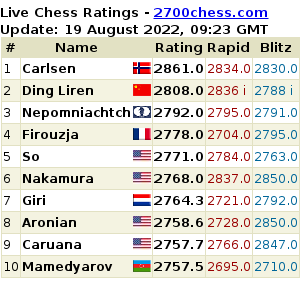 In addition, the two finalists are already qualified for the 2018 Candidates tournament.